A couple of weeks ago, I went through a common parenting challenge: Dr. Mom’s dilemma. You know—the battle of deciding what to do when your child gets sick. I’ve been to the doctor dozens of times. Usually, I left with no prescriptions and a reassurance that things would be fine in a few days. A few appointments have led to antibiotics and referrals. But it’s not knowing which type of appointment this will be where my conflict begins. My daughter started showing symptoms for a urinary tract infection. She felt the need to go the bathroom frequently, felt some discomfort, and sometimes had no need by the time she got to the bathroom. This was the first time any of my kids experienced a UTI. I began looking online for remedies and recommendations. The second day passed with a feeding of a probiotics powder once and baking soda in water a few times. The third day, my daughter said her stomach was hurting. I began to get worried and did further research. Another possible remedy I discovered, D-mannose, can naturally be found in cranberry juice (which is why it’s so often suggested to help with UTIs). But cranberry juice comes with a lot of other things, including sugar. Instead, I decided to buy some D-mannose powder from our local natural store. I told the consultant it was for my 5-year-old daughter. She looked a little worried and told me last time she got a UTI, it only took two days for it to spread to her kidney. At this point, I graduate from worried to pretty nervous. Guilt kicked in for not taking my daughter to the doctor right away. I decided to pass on the D-mannose and immediately called the doctor to make an appointment. I was so grateful our pediatrician’s office is open on Saturday mornings. I also texted my girlfriend, a pediatric RN, asking if this is something I should really be nervous about. She texted me back, saying I should go to the doctor just to make sure. The next call went to my mom. She, of course, prescribed the heating pad treatment (no surprise there) and plenty of fluids to flush out the bacteria. As I began to prepare her clothes, my daughter said she was feeling much better—just a few hours after she complained about her stomach pain. She said she only had to go to the bathroom two times the night before and was able to get everything out. At this point, I’m thinking I don’t need to take her to the doctor, she’s been active as usual, and it could have been the baking soda that upset her stomach. I decided to ask my mom to stop by my house before she went to work so I could go the natural store quickly and get the D-mannose powder. I’m glad she lives so close to us. She agreed. Right when she came over, my husband called and got upset with me for not taking our daughter to the doctor. “If you don’t want to do it, please do it for me,” he says. “Really? You’re going to believe what a 5-year-old says?” Confusion overwhelmed me. Throughout this whole experience, I believed the natural remedies were going to work, but doubt and potential guilt interfered with my instinct. I called the doctor’s office and asked to talk to the nurse. I described all the symptoms and explained that my daughter was feeling better. The nurse told me to watch her symptoms until Monday, and if she had a fever, to take my daughter to the urgent care. Finally, a legitimate validation! I went back to the natural store and got the D-mannose. I started giving her one packet of probiotics and a scoop of D-mannose every 2.5 hours. You often hear the saying “Go with your gut,” but the gut is deep and the channels that route to it are clogged with emotions, feelings of doubt, with people’s opinions and their doubts, along with fear of negative outcomes. Taking risks becomes dramatically more difficult when children are involved. Experience may help in many cases, but even then fear can be overwhelming. The journey of raising children involves repetitive hills as well as random terrains. You’re just never prepared when your child gets sick, no matter how experienced you are as a parent or how old your children are. As for my daughter, she was just fine by Monday morning after 10 scoops of D-mannose and three packets of probiotics powder. We managed to avoid antibiotics once again. Score one for mother’s intuition! As a physician and mother, of course I clicked on the article based on the title. I was disappointed that the title was so misleading. The article itself is fine and her concerns and experiences are valid, but to title the article “Dr. Mom” and discuss how saving a child by rushing them to the alternative treatment store and avoiding doctors and other healthcare practitioners who are trained to evaluate for true medical emergencies is not just insulting to actual “doctor moms” and our decades of tireless and exhausting training and experience and constant dedication to evidence based medicine and quality and safety in healthcare, it is dangerous advice from a false title of “Dr”. One of these times, some child is going to have a true medical emergency and not seek proper help for it if this is what they see on the internet from a “Dr”. Yes moms, go with your instincts, but don’t claim to be a doctor and give unsafe medical advice. Don’t brag about going against medical advice (of your pediatric RN friend) and how “Dr Mom saved the day”. Your personal experience as a MOTHER is valid and surely your child was just fine no matter what home remedy you chose despite your apparent panic and unreasonable rationale, but don’t pretend to call yourself a “Dr”. This article is so harmful to the general public, it should be considered for retraction. As a real doctor mom I have to say this article is awful. Most cold symptoms don’t have to be rushed to the pediatrician but UTI is one that does. Like someone told you in this article, it can lead to kidney infection. Oh yes and shock, sepsis, and death. Or sometimes the person just loses their hands and feet to sepsis but survives. 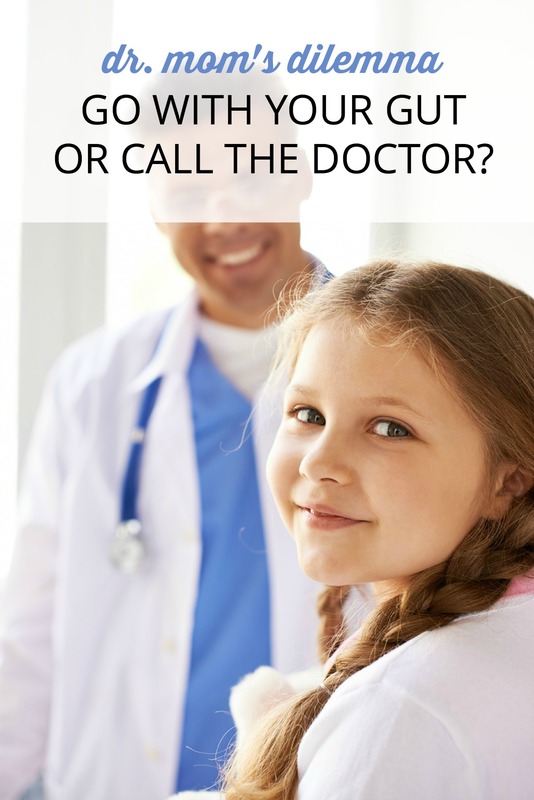 Maybe you could use the nurse line to stay in touch with your pediatrician next time. From a mom and ER doctor.